First, I started podcasting with my good friend, Autumn, who provided mountains of insight as to what it's like to have Celiac's--especially in terms of eating out, baking and cooking. She answered my unending questions with grace and patience, but I didn't want her to feel like my personal Gluten-free Wikipedia. So, about a month ago, I started taking a gluten-free baking class. Prior to donning the uniform again, I had no concept of how to make gluten-free substitutions in baking except that it likely involved xantham gum and brown rice flour. The class has taught me so much about varying levels of gluten tolerance, the ingredients used in place of wheat flour, their baking properties and the role they play in providing taste, texture or structure. Most importantly, though, it's forced me to block off three hours from my Tuesday to dive in and attempt gf recipes! Admittedly, baking gluten-free from existing recipes was not much different than following recipes in any of the other cookbooks I owned; the ingredient list was a little longer (with new ingredients!) and the volumes were slightly less in some cases, but if you can follow a recipe and buy the ingredients, you should be fine! Naturally, as I've been immersed in the class, I find myself baking gluten-free during the rest of the week to familiarize myself with new flours and ingredients (which is why there haven't been many posts around here! sorry!). So, when the group of holiday bloggers who made amazing St. Paddy's Day treats sent out the reminder about teaming up for a round-up of fantastic Cinco de Mayo posts, I knew I wanted to find a way to adapt a recipe I already loved and make it gluten-free! The texture is a bit drier and denser than a normal cake (Alton's original recipe produces the same result), but remember, it needs to be to absorb all that milk! Adapting a recipe was a lot more challenging than I expected, mostly because I try to avoid math like the plague. My substitution for all-purpose wheat flour was an all-purpose gf flour blend of brown rice flour, tapioca starch and potato flour. If you use a different blend, by all means, experiment! In the few times I've tried pre-mixed blends, I wasn't happy with the result, so I've steered clear, but if you've got a gf flour blend you love, leave the name in the comments! Happy Baking & be sure to check out what the other gals in the Cinco de Mayo roundup are making (links after the recipe)! Happy Cinco de Mayo! Gluten free Tres Leches Cake - delicious gluten-free vanilla cake meets three milks for a decadently delicious, sweet cake perfect for Cinco de Mayo! Preheat oven to 350 with rack positioned in the middle of the oven. Grease and flour a 8x8" square pan with the 2 tablespoons brown rice flour. In a medium bowl, sift together dry ingredients--brown rice flour, tapioca and potato starches, baking powder, xantham gum and salt. In the bowl of a stand mixer (or medium bowl), beat the butter 1 minute on medium speed. Reduce speed to low to gradually beat in sugar until combined. Beat an additional 3 minutes until pale yellow and fluffy. Add eggs, one at a time, scraping the sides of the bowl after each addition until well combined. Stop mixer. Add 1/3 of the flour mixture and beat on low until just combined. Scrape sides of bowl. Add remaining mixture in two additions until the dry mixture is well incorporated, scraping the sides of the bowl with a spatula after each addition. Pour into prepared pan. Bake for 25-30 minutes or until the top is golden brown and a toothpick inserted into the center of the cake comes out clean. Allow cake to cool in pan for 30 minutes. 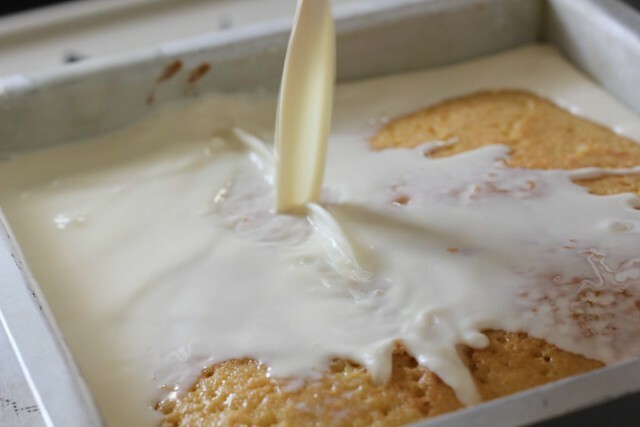 While cake is cooling, whisk together half and half, evaporated milk, rum and sweetened condensed milk. Once cake has cooled, prick the surface of the cake with a fork, making numerous holes. Carefully pour the milk and rum mixture evenly over the top of the cake, allowing it to soak up the liquid. Refrigerate and let soak for 4 hours or overnight. An hour before you are ready to serve the gluten free tres leches cake, combine the vanilla extract, whipping cream and sugar in the bowl of a stand mixer. Whisk on low speed until soft peaks form. Increase speed to medium until stiff peaks form. Remove whipped cream from bowl and spread over the top of the tres leches cake. Refrigerate until ready to serve. Check out the delicious Cinco de Mayo sweets & eats from some of my friends!